This past week, I got my first blog award. And then a few days later, I got another blog award! I was so excited to receive both awards!!! I got the first award from Simply Life. And I got the second award from Cindy at A Sparkle a Day. We canceled Cable T.V. a few months ago, and I haven't watched T.V. since. We also moved our couch, so now it's all but impossible to watch T.V. I love long, very hilly hikes. There is nothing better than making it to the top of a mountain! Unfortunately, since the toddler was born, I haven't had the chance to go on many hikes. I love swimming in the ocean (but don't do it anymore as I realized that swimming with sharks isn't such a great idea!). Growing up, I played the recorder. I love Korean food (even more than my Korean husband loves Korean food). I recently "discovered" the steam room at my gym. There is nothing that relaxes me better than 10 minutes in the steam room after a workout. 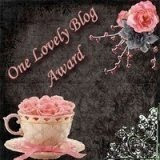 Okay, this is where I'm supposed to give this award to other blogs. But after thinking about it, I decided it's just too difficult to give these awards to just some of you. I read so many wonderful blogs and am touched by so many of you! So, if you are reading this post, consider yourself given these awards. And please share something about yourself that we (probably) don't know about you in the comments. Question: What is one thing (or two, or three or four) that we don't know about you? I love it about not watching TV! When the cable switched our TV is so old that we had to buy the new device to get any channels at all and just decided not to get it! We can watch some shows online, like The Office, but otherwise it's nice to simply not have the option and I definitely don't miss it! I'm tall too :) (Almost 5'10".) Unlike you, I was actually short until 9th grade, and then the summer before 10th grade I grew 7 inches. It was kind of crazy. Being tall is good though - I can always reach things. haha, check out my blog post for the answer to that question :) I did the same thing you did! Great idea getting rid of cable. I don't think Nick would EVER go for that, but maybe some time down the road I could test that theory. Congrats on the awards. It's always nice to get to know people a little better especially in the blogosphere. Here's one thing no probably know about me. I used to be 50lbs overweight. Now I'm 50 lbs lighter. Lucky you for being tall. I'm about 11-inches shorter. Makes it easier to hide. LOL. Love getting to know a little more about you!! Most of you probbly don't know that I can't go a day without my hot rollers- I use them in my hair every day- and, sometimes, in a pinch, I've even been known to wear them in the car if I'm running late!! One time I actually got pulled over for speeding early in the morning with rollers in my hair!! Have a great weekend, Andrea!! I also don't watch tv, it's a waste of time I find. Also adore swimming in the ocean, sharks smarks! I was pretty tall by the age of 12 too. My current height, which is not as tall as 5'11 (5'7), but still taller than all my friends and all the boys, haha! I don't watch too much tv either...only during breaks, and even then I limit it to food network or korean dramas. Speaking of korean stuff, I love korean food too! What an honor - congratulations! - I play ice-hockey with guys, and I love it! Great post, keep up the great work...you're a wonderfully inspiring blogger! Congrats on the awards! I am a ketchup fiend, used to take horseback riding lessons, watch all of the worst tv you can imagine,love spicy food, the spicier the better, and I could eat salsa, chips, and guac for pretty much every meal of the day! Haha, I definitely noticed you love Korean food...but for some reason I thought your husband was Japanese! Where did THAT come from? Hmmm...some things about me...I HATE cooked carrots. I have a black belt in Tae Kwon Do. I secretly wish I could be a leading star in a Broadway musical. Hmmm...some things about me is that 1) I love bubble tea 2) I wish I was more outdoorsy 3) I really like woodworking. I've gotten fairly serious about it in the last few years: I made E's crib from scratch. I played the flute when I was younger. I used to have a pet bunny named Lucy after my grandmother. I like veggies better than fruit. I love hiking as well!! Wow, I admire all of you for ditching the TV. I guess it makes sense with the number of things you can watch on the computer...something to work on!! Congrats Andrea! I do love your blog and laughed that I also played the recorder in school, haha! !